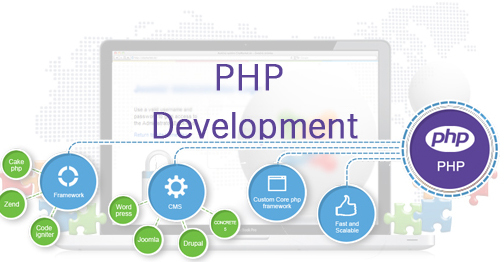 With a professional PHP development team of expert professionals, we have worked on more than 500 projects & have achieved concrete results for our clients. From creating micro sites for start-ups, fully-featured online presence for SMB's or multi-faceted enterprise applications for fortune 200 companies, we have hands-on experience in developing custom PHP solutions that easily meet the unique business goals of our clients. 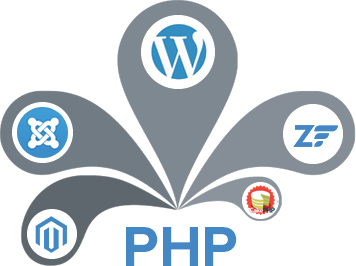 With 7+ yrs of hands on experience in PHP, we can offer high level customization while creating & deploying extremely reliable services of outstanding quality. From dynamic websites to interactive business applications, customized software to e-commerce solutions, open source implementation to rapid application framework development, we have a pool of specialized PHP professionals who can develop applications of every nature, size and complexity. Our agile team of certified PHP engineers work with LAMP stack (Linux, Apache, MySQL,PHP), Ajax, Web 2.0 & 3.0 technologies to add interactivity to your web applications and makes them highly secure, reliable & effective. Success of every website depends on multiple factors including usability, search engine friendliness, flexibility, cross-compatibility and security etc. Being a full-service digital marketing company, we understand that your website needs much more than just development. It has to be found in search engines & so it's structure should be optimized for higher conversions. Here, we deliver you everything at one place keeping in mind a complete online presence that helps you succeed. PHP based requirements, Whatsoever may be your project requirements, simple or complex, our expert developers ensure you get the best possible solution tailored to your business goals & flexible enough to meet future requirements as well. Logo creates strong brand recognition and familiarity for a business. It makes people think of your service or product as soon as they sight it. It conveys professionalism. It helps build trust. We are having more than 7 years of experience and helped hundred of companies to establish their brands. At Mywaptech we understand the pivotal position a logo has in creating a brand identity and we are always eager to take up this challenge as it brings out the best of creativity from out team. Mywaptech Logo Design team has the technical and creative competencies to develop, build and create a unique identity that is, a unique logo for your business.